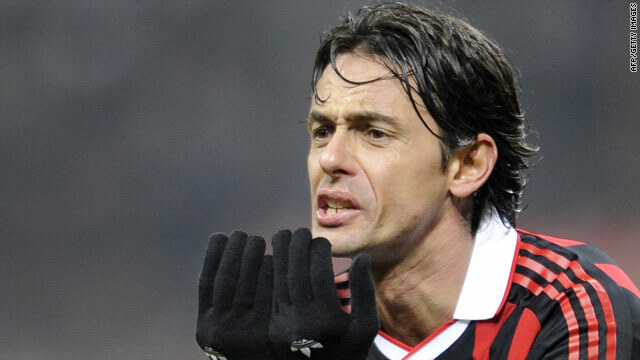 Veteran striker Fillippo Inzaghi opened the scoring for AC Milan in their 2-1 victory over minnows Novara. (CNN) -- Mathieu Flamini scored the winner nine minutes from time as a second-string AC Milan side beat third division Novara 2-1 at the San Siro on Wednesday to reach the Coppa Italia quarterfinals. Milan coach Leonardo made 11 changes to the side that won 3-0 at Juventus on Sunday with Ronaldinho, David Beckham, Andrea Pirlo and Alessandro Nesta not even included on the bench. Veteran striker Filippo Inzaghi opened the scoring on 12 minutes but in the first minute of the second period Pablo Gonzalez stunned the home fans by drawing Novara level. But French international Flamini won the match for the Rossoneri with a shot from the edge of the penalty area. Milan will now will play Udinese or Lumezzane for a place in the semifinals. Meanwhile, Juventus bounced back from their weekend humbling as an Alessandro Del Piero double, one from the penalty spot, helped them to a 3-0 victory over 10-man Napoli in Turin -- easing the pressure on under-fire coach Ciro Ferrara. Diego scored the opener as a full-strength Juve blew away Napoli's 14-match unbeaten run under coach Walter Mazzarri, although he did rest many first team regulars. Napoli had Matteo Contini sent off for a second yellow card for a foul on Diego in the lead-up to the penalty. Catania recorded an impressive 2-1 win away to Genoa to also reach the last eight. Two goals from Gianvito Plasmati put the visitors two up before Marco Rossi pulled one back 57 minutes. But Genoa hopes of a comeback were dashed when Socratis Papastathopoulos (58) and then Rossi (59) were both sent off. Inter Milan and Roma had previously also qualified for the quarters, with the final three qualifiers to be decided on Thursday.